Journal Prompt 14: What is your favorite quote? Mine changes a lot because different things inspire me during the different seasons in my life. Quotes are powerful reminders of the wisdom we can gather and share with others. This quote has always been one of my favorites. I used to have this bumper sticker on my car at one point in high school too :) Haha! 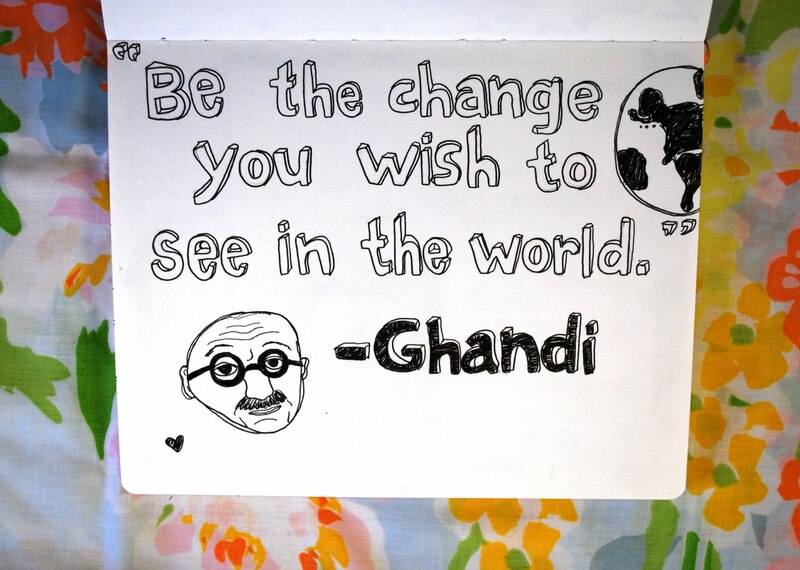 I am still laughing a bit at my sketch of Gandhi. Again, not using a pencil means that I have to be confident enough to jump in there and try drawing something even if I'm not sure what I am doing. This is something that I like doing because I know it's something I have to work on. Inspire me with your words of wisdom my friends. I can't wait to see these in the Flickr group! Fun! It really does look like Gandhi! I think your drawing of Gandhi looks pretty realistic. I always have to Google his name. No matter how many times I quote him, I am never sure. Ha. My name is annoyingly misspeled alot too... Baily without the E.
I am trying to catch up as fast as I can! I am going to post my pics to the Flickr group tonight. :) Yay! I think your sketch of Gandhi is awesome! It looks like him... and I never know where to put the 'h' either.